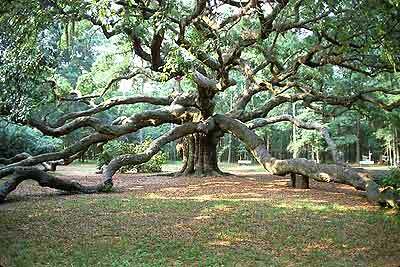 Angel Oak Park, just a short drive from Folly Beach, is home to “the oldest tree east of the Mississippi.” The Angel Oak is a live oak, a tree native to the southeast Lowcountry, especially the sea islands. Although the age of Angel Oak has long been reported to be in excess of 1400 years, the actual age has never been scientifically substantiated. This is because live oak trees have a tendency toward heart rot, which makes the core samples untestable. 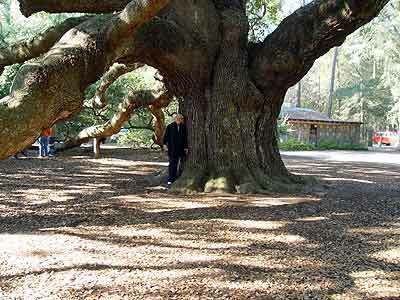 Live Oaks are not tall trees; however, their canopies are exceedingly wide. Only in the very oldest specimens, like the Angel Oak, do you find massive limbs, heavy by the weight of the years, resting gracefully on the ground. Many people mistakenly believe the name “Angel Oak” refers to a type of Live Oak, but actually this name comes from Martha and Justis Angel who were owners of this property generations ago. This tree is breathtakingly huge!!! Ive included a photo with me standing near her in order for you to get a feeling for its size. The dimensions of Angel Oak are as follows: Height – 65 Feet, Circumference – 25.5 Feet, Area of Shade – 17,000 Square Feet, Largest Limb – 89 Feet Long, 11.25 Feet Thick. When you visit there, you will see a little brown shack beside the tree. In the shack is a delightful gift shop that could easily be missed if you didnt know it was there. Take a look inside at some of the unique gifts, many not available elsewhere. The proceeds from the gift shop support the maintenance of Angel Oak and the park which are both open to the public free of charge.